India has quietly put into active service its first ballistic missile submarine in August, according to news reports. If so, India will have taken the last necessary step to possess a nuclear triad, the ability to launch nuclear weapons from air, land, and sea. The Indian government neither confirmed nor denied reports of the commissioning of the INS Arihant, a nuclear-powered submarine capable of launching ballistic missiles. It can be equipped with 12 750-kilometer-range K-15 missiles or four 3,500-kilometer-range K-4 missiles. A K-4 missile launched from the northern Indian Ocean could reach China and Pakistan. The K-15 has been operational since July 2012, but the K-4 is estimated to require further testing before deployment. But the Indian government has made no announcement about commissioning the Arihant. The defense ministry did not confirm or deny that the submarine had been commissioned in August, reported The Diplomat on Oct. 19. When asked about the Arihant, the ministry and the Indian navy refused to comment on the grounds that the submarine program is a strategic and classified project, according to an Oct. 18 Times of India article. “There will soon be an opportunity to talk about it,” Vice Admiral GS Pabby stated in response to questions about the submarine at an Oct. 18 event, reported Hindu Business Line. 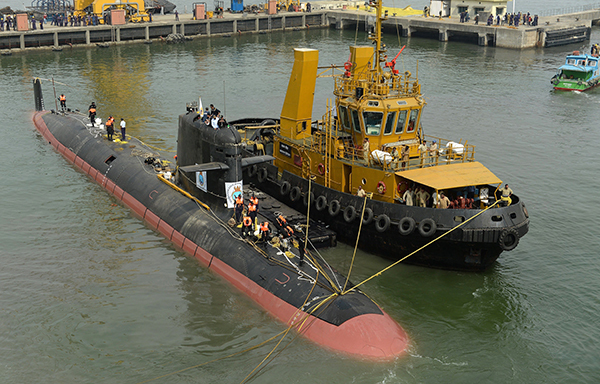 Several members of India’s defense community welcomed the news reports that the Arihant had begun active duty, citing the gap between India’s submarine fleet and those of other nuclear powers. As of 2015, India possesses 15 submarines while rival China has more than 50 conventional submarines and four nuclear-powered ballistic missile submarines. The implications of India’s acquisition of a ballistic missile submarine are a “mixed bag,” Shane Mason, a research associate in the Stimson Center’s South Asia program told Arms Control Today on Nov. 15. Although such submarines are the most survivable leg of the triad and could enhance deterrence, they may create command and control challenges for India and give Pakistan an incentive to pursue its own sea-based leg of the nuclear triad, Mason said. In India, nuclear command and control traditionally has been directed by the political sector, not the military. “The practice of sea-based deterrence will be a new one for India and will upend the country’s tradition of strict civilian control of nuclear forces,” Mason said.